ଜିରା ଗଛ ୩୦ରୁ ୫୦ ସେଣ୍ଟି ମିଟର (୦.୯ରୁ ୧.୬ ଫୁଟ) ଲମ୍ବା ହୋଇଥାଏ। ପତ୍ର ଗୁଡ଼ିକ ସରୁସରୁ ଓ ଗୋଟିଏ ଫଳରେ ଗୋଟିଏ ମଞ୍ଜି ରହିଥାଏ। ଏହାର ଫୁଲ ଗୁଡ଼ିକ ମଧ୍ୟ ଛୋଟଛୋଟ ଧଳା ବା ହାଲୁକା ଗୋଲାପି ରଙ୍ଗର ହୋଇଥାଏ। ଏହା ଦେଖିବାକୁ ଅଳ୍ପକେ ପାନମଧୁରୀ ପରି. ଜିରାର ବାସ୍ନା ତା ଭିତରେ ଥିବା ତେଲ (ଏସେନ୍ସିଆଲ ଅଏଲ) କାରଣରୁ ହୋଇଥାଏ। ଏହାର ମୁଖ୍ୟ ରାସାୟନିକ ତତ୍ତ୍ୱ ହେଉଛି କ୍ୟୁମିନାଲଡିହାଇଡ (cuminaldehyde) (4-isopropylbenzaldehyde)। ଜିରାରେ ଥିବା ଅନ୍ୟ ରାସାୟନିକ ପଦାର୍ଥ ଗୁଡ଼ିକ ହେଲେ pyrazine, 2-ethoxy-3-isopropylpyrazine, 2-methoxy-3-sec-butylpyrazine, and 2-methoxy-3-methylpyrazine, beta-Pinene ଓ Terpinene ବା Gamma-terpinene. ↑ "Cuminum cyminum information from NPGS/GRIN". www.ars-grin.gov. Retrieved 2008-03-13. 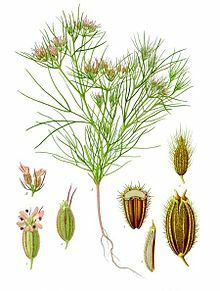 ↑ Food Facts & Trivia: Cumin. Foodreference.com (2007-04-08). Retrieved on 2011-11-26. ↑ Search the USDA National Nutrient Database for Standard Reference. Nal.usda.gov. Retrieved on 2011-11-26. ↑ Wang, Lu; et al. (2009). "Ultrasonic nebulization extraction coupled with headspace single drop microextraction and gas chromatography–mass spectrometry for analysis of the essential oil in Cuminum cyminum L". Analytica Chimica Acta. 647 (1): 72–77. doi:10.1016/j.aca.2009.05.030. PMID 19576388.